This week, Facebook announced a new ‘suite’ of tools aimed at media organisations and publishers which are intended to “help them better connect with people on Facebook”. Of course, whilst the tools may be aimed at media outlets, this doesn’t mean that marketers and small business can’t also put the tools to use for helping to distribute content. It may, in fact, convince some to stay with the site after it was announced earlier this year that we’re likely to see a drop in organic reach come January. 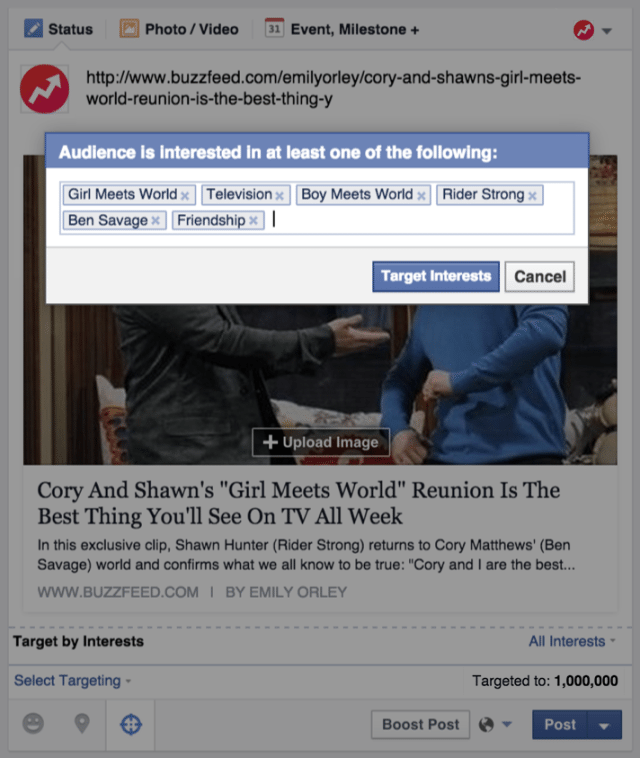 Interest targeting – this allows you to target posts to people with specific interests that like your Page. For example, if a media Page runs a story about a sports game, the post can target just those that like that particular sport. Post End Date – this allows you to place an end date on a post so that it no longer appears in user newsfeeds. This is ideal if you’re running a promotion that only lasts for a couple of days. Smart publishing – this identifies stories that are proving popular with users and publishes frequently shared links to your website in newsfeed. Improvements to Insights – Insights have had improvements made to the Domain Insights which show data about how Pages and social plugins drive traffic to your website. Interest targeting is already available to everyone, but you must have enabled the Targeting and Privacy setting in Page settings. It’s only available on desktop currently though, so you won’t be able to use it with the Pages app. This is good news for those who have managed to build a Facebook audience that’s very relevant and holds many of the interests that you might create content around. The improved targeting option means that it’s likely that you’ll now be able to reach those fans who may have not been seeing relevant stories come up in their newsfeed. Once you’ve enabled the option in settings, click into the status box and you’ll see that you have new items in there. Click on the icon and you’ll then get the option to add further targeting. You can of course choose by gender etc., and this is very useful, but the new Interests option is more so. Note that before you add options, the ‘targeted to’ number is the amount of people that follow your Page. Once you begin adding targeting options, this will change to reflect the amount of people that like your page with those particular interests. You’ll more than likely have to play around a little, depending on the type of content that you produce and the amount of followers you have. According to Martin Beck, writing for Marketing Land, the options aren’t always very relevant or intuitive, so it may take a little guesswork and experimentation. Anything that helps with organic reach has to be a good thing, especially since it allows you reach people with specific interests. Whilst Post End Date is now also available to everyone under the same setting as above, Smart Publishing is currently only available to a few lucky select media organisations. The setting is optional and you enable it through settings and the Publisher Tools option. It’s thought that the new tool will be rolled out to the rest of us over the course of the next few months when businesses will be allowed to opt in too. Whilst the posts that show in the newsfeed automatically don’t appear on your Page, you will be able to access a new dashboard in Insights that allows you to choose which links you’d like to post to your Page as well as see analytic and moderate comments made on the newsfeed post. The new feature is undoubtedly designed to encourage content creators to share more on the site and there has been talk of revenue sharing with them too in the past, but on that score we’ll have to wait and see. To take advantage of the improvements to Domain Insights, you’ll need to associate your website with your Page if you haven’t already. To do this, go to your Pages dashboard and under your list of Pages you will see a link for Domain Insights. Click on this and add your website in the box, then go to your site and add the meta tag that’s generated to your website. Once you’ve done that you’ll be able to see the new ‘Top URLs’ section which “displays URL-level reporting and shows where other Pages and influencers share a post you’ve made to Facebook”. The new tools for Facebook is good news for the site, which has seen a lot of criticism for its drop in organic reach with analysts at Forrester even going as far as to say that marketers that advertise on the site are wasting money. The new tools give information in the form of new insights which can be linked to your website for deeper analysis. There’s little doubt too that the Smart Publishing feature could prove to be highly useful for those that create a lot of content, although it’s fair to say that the large media organisations will be the biggest winners. The new targeting tool too is likely to prove very useful for improving organic reach and is the most talked about one so far. It seems that Facebook is stepping up its game in order to prove its marketing value and I for one am looking forward to getting stuck in and using the new features. This entry was posted in Social and tagged Facebook organic reach. Thanks for the info. Am a fellow author also and always interested in my target audience.